(CNN) -- Iranians have had to tailor their usual ways of communicating in the post-election tumult that has swept through the country. 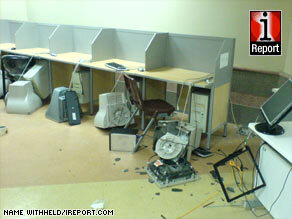 The aftermath of anti-riot police actions at Tehran University shows smashed computer terminals. "Censoring is very bad here and they have reduced Internet speed," two Iranians who had sent pictures of casualties from a reported attack on a dorm at the University of Tehran wrote to a friend outside the country. "We managed to upload a few pictures and movies ... please give it to news agencies and ask them to air it," they asked. CNN is not identifying the friend or his location to protect the identities of the Iranians. Local television was derided by some as communicating just fine -- but giving unreliable information. "Iranian TV isn't giving the big picture," a man in Tehran told CNN. "They are depicting the protesters as anarchists. They even report that students are finishing finals at the university when the place has been shut down for days." The complaints came as Iran's elite Revolutionary Guard Corps said Wednesday it will pursue legal action against Web sites that it said were spreading lies in order to incite people into rioting as protesters demonstrated against last week's disputed presidential election. The Guard also blamed U.S. and Canadian companies, including American intelligence agencies, of financially and technically supporting the Web sites. "We will very soon inform the public the details of these destructive Internet networks and we warn the people who want to use cyberspace to incite riot, threaten people and create rumors that legal action will be taken against them and the penalty they will pay is very heavy," the Guard said in a statement carried by the Islamic Republic News Agency. The government accused international reporters of being the "mouthpiece" of "hooligans" who have created unrest and said it could not guarantee the safety of those reporters. A CNN iReporter said many Internet sites had been blocked and service was cut to cell phones in some areas. Twitter and other social messaging sites were blocked Thursday in Iran, people who tried to get into them told CNN. He said Iranians had told him that Internet access remained unaffected at two universities. He added that it appears that the government has also blocked secure-interface Web sites -- the kinds used for banking -- which are often helpful in circumventing rudimentary filtering efforts. "As far as we can tell, their blocking mechanisms are more sophisticated than some we've seen in other countries," he said. But some people are getting around the restrictions by using Googletalk and other instant messaging tools to post and read on his Web site, he said. "We've heard that the government hasn't blocked those services as actively as they block Web sites." "We've seen lots of Iranians get around it with proxy servers," said Scoble, whose wife is Iranian and who has been following the post-election frenzy closely. He said some people on Twitter were feeding proxy addresses to Iranians for use in getting around the blocks, but that the efforts were no panacea. "The problem is the normal, everyday citizen doesn't know how to do that," he said. "Any kid knows how to do that, but it's a little bit geeky." Facebook, too, has been affected, said spokesman Barry Schnitt. Users have resorted to e-mailing the company to report the difficulties they are having, he told CNN. But, he added, "There are lots of ways around those kinds of things." Despite the restrictions, organizers were still gathering massive crowds to rallies the old-fashioned way -- through person-to-person contact. All About Iran • Tehran • University of Tehran • Iranian Revolutionary Guard Corps • Twitter Inc. • Facebook Inc.